In honor of one of my favorite holidays (probably because my birthday follows a week after) I wanted to share my latest "springy creation". There were so many cute cupcake ideas for Easter all over the web it was so hard to choose one. I was overwhelmed! I ended up doing two but I'll share the other another day this week. If you're still stuck with the task of finding something fun to make, this one is super easy and sure to please. 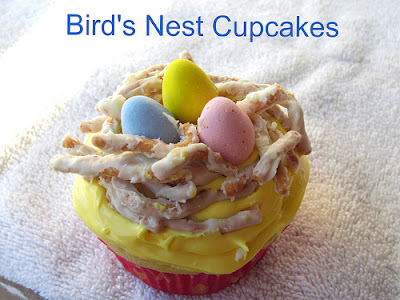 Bird Nest cupcakes! The kiddos will love them! Keep in mind I did a mini version and made them for two since it's just hubs and I. But you can choose any cupcake recipe you like, any frosting recipe you like too so you can make more! For the cupcakes I used my vanilla cupcakes for two recipe (minus the white chocolate) and my white chocolate buttercream recipe. I dyed the icing yellow with food coloring. It took about 8 drops to get it the color I wanted. So... baked your cakes, let them cool, and whip up your frosting. Set aside. Take your candy coating and melt it down my microwave or saucepan. Since I used white chocolate morsels, I stuck them in a small saucepan and melted them down over low heat for about 1 minute. After the coating is melted, pour over chow mein noodles in a small bowl and mix until noodles are completely coated in chocolaty goodness. Allow noodles to dry before using. Takes about 10 minutes. 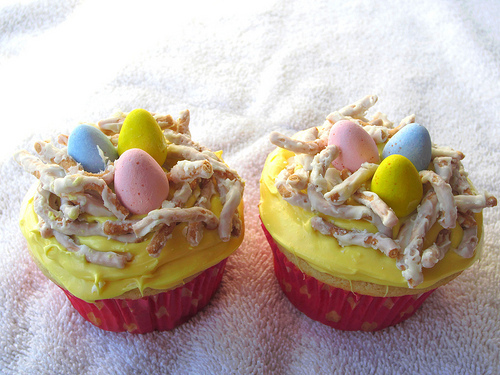 Frost your cupcakes with your yellow icing and then add 3 Cadbury eggs to the center of your cupcake. 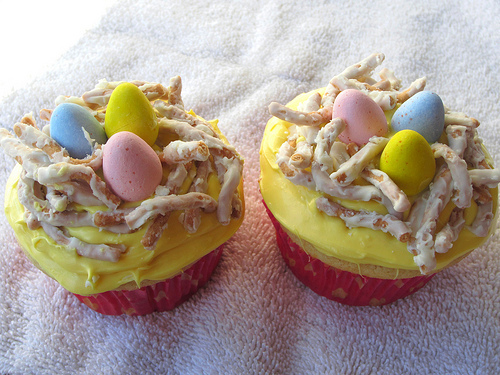 They should stick upright since the frosting is still wet. 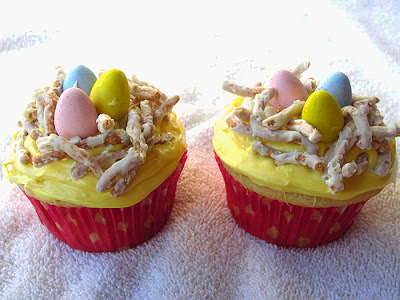 Then take the candied chow mein noodles and shape them into a nest around the eggs. Voila! You have some adorable bird nest cuppycakes that will even impress the Easter Bunny.